. 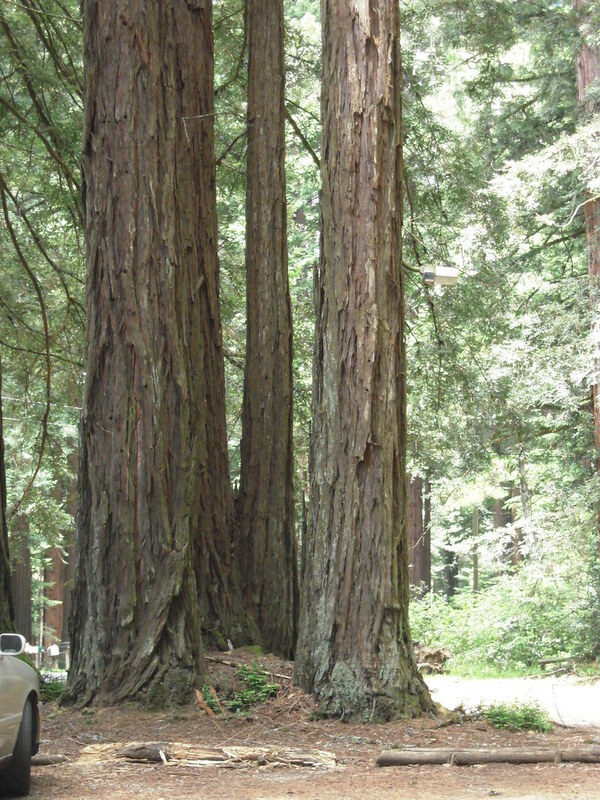 . . from the redwood forest . . . I posted this two years ago, and it is still the way I feel about our country! Enjoy this RE-post and Happy Fourth of July, 2011! Who among us doesn’t remember singing along and feeling proud of our countryside? It was an era of protesting the educational system, the government, the war, the “establishment” in general, and anything else we could protest, but we loved our land – the unique geography that makes up these United States. 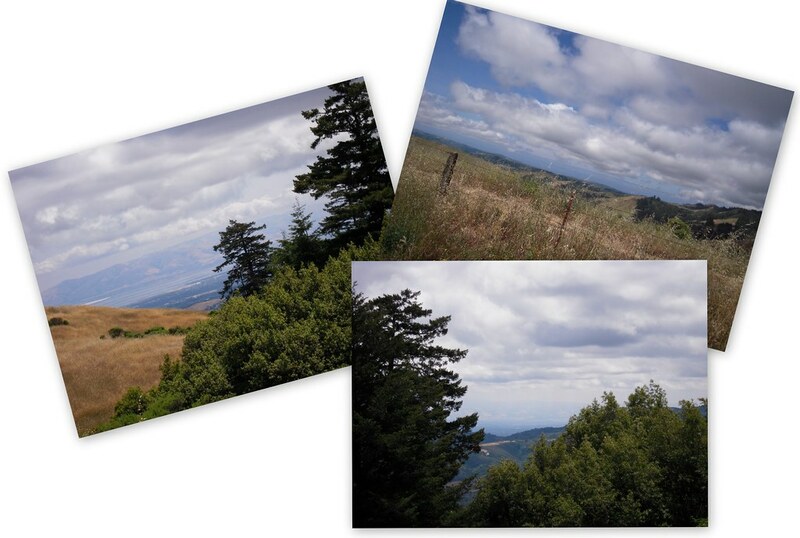 During the past few weeks while I was in California, I re-visited the coastal range where I’d spent so much time during the 70s and 80s. 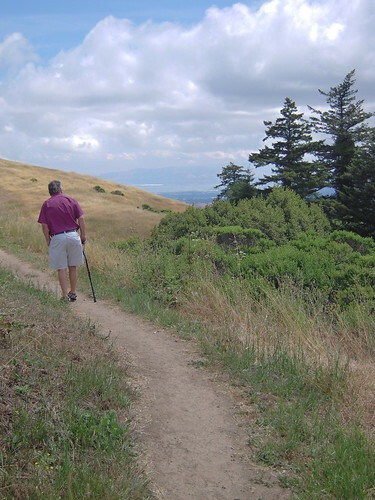 Some of those years were spent in the San Francisco Bay Area and some were along the Central Coast of San Luis Obispo County, but it’s all fairly similar. Winding through the streets from Palo Alto toward the Pacific Ocean, I felt the same sense of freedom that I had so many decades ago. Much has changed, but the terrain will remain the same forever, I think. Because I was at the wheel, I couldn’t take as many pictures as I wanted to, so mostly they exist only in my mind’s eye. I was able to stop and get a few shots, however. One of the stopping points along the crest was the Windy Hill Open Space Preserve. This sign warns visitors what to do in case they encounter a mountain lion. 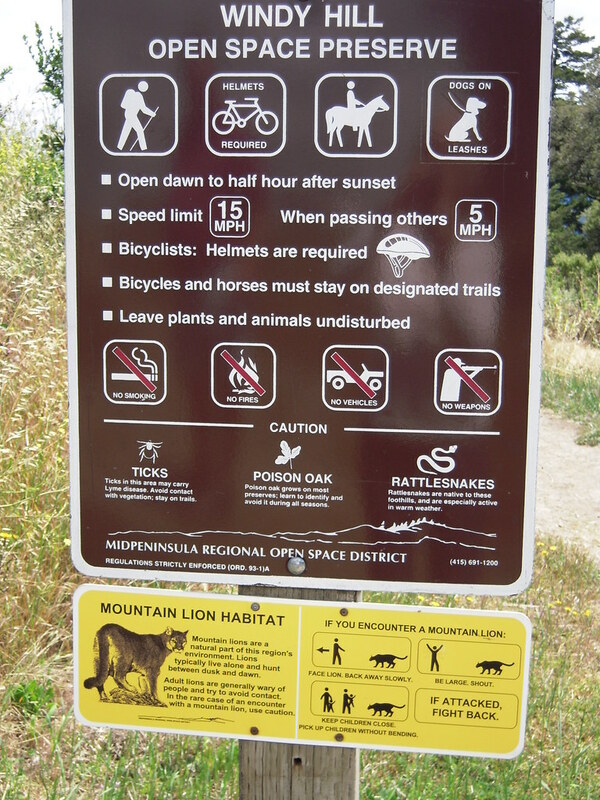 Beyond the sign, a path led into the preserve area. The sky was just as beautiful as I remember it. We used to call the hills “golden,” even though they were basically just “brown.” I still love those golden rolling slopes. 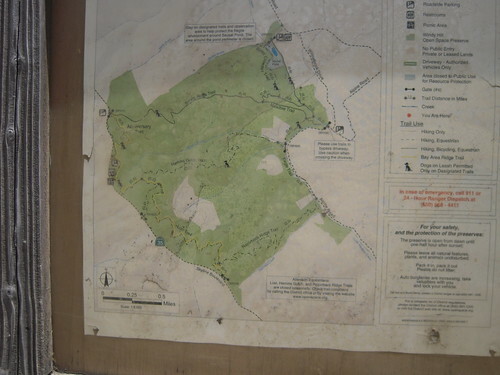 This preserve of 1,312 acres includes 12.2 miles of trail. Please check this link to read more about it. 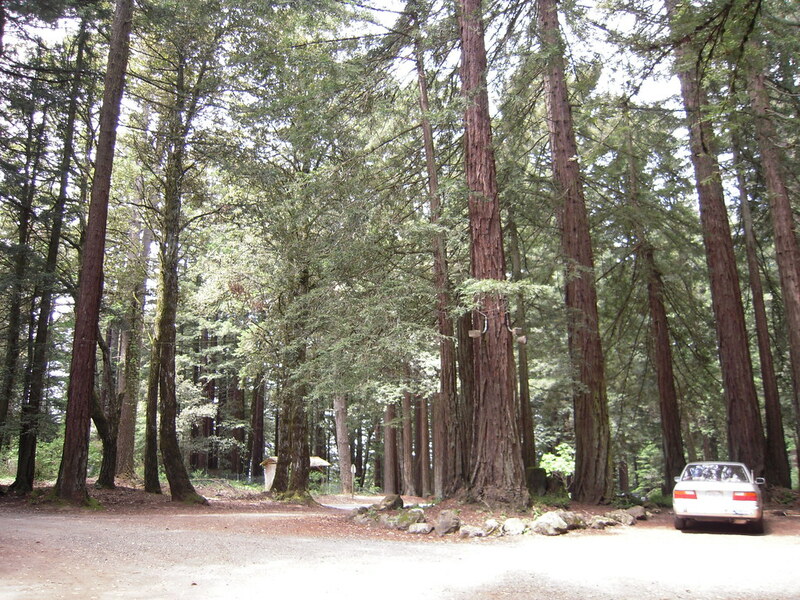 If you carefully cross the road from the parking area, you get a spectacular view of the Peninsula. Another stop along the drive was by a restaurant that was closed for the day. 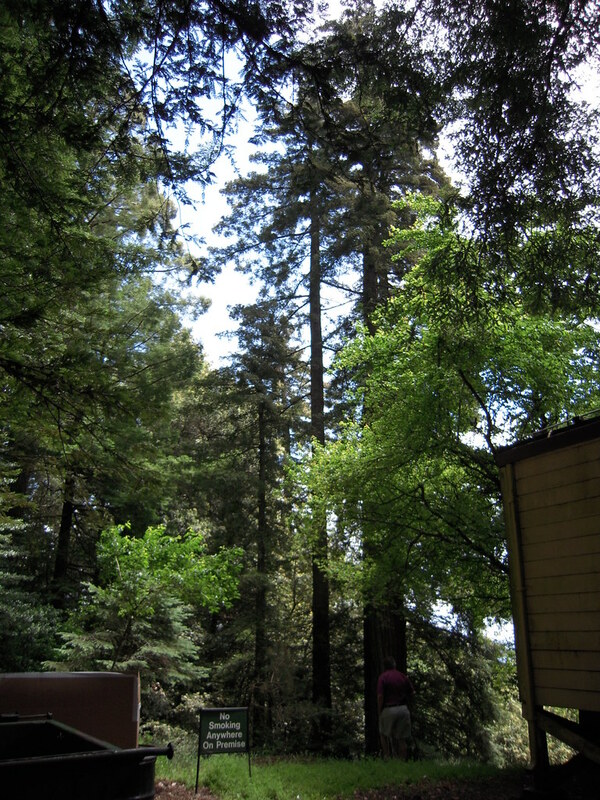 It was explained to me about the “second-growth” redwoods. As you can see here, there is a cluster of trees around a bare piece of ground. 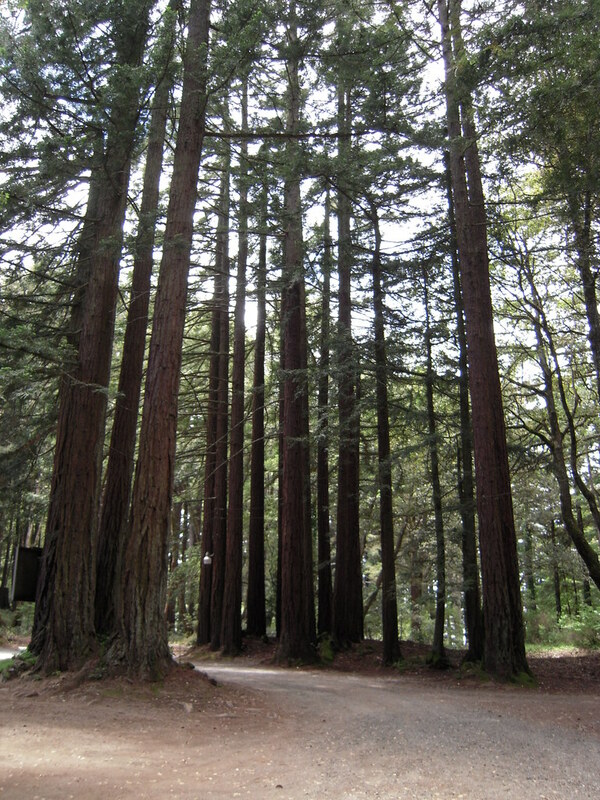 The original old redwood was either logged out over 150 years ago or could have been hit by lightning. These new “baby trees” sprouted up around where the mother tree had been. The opening photo gives another perspective on a grove of second-growth trees. 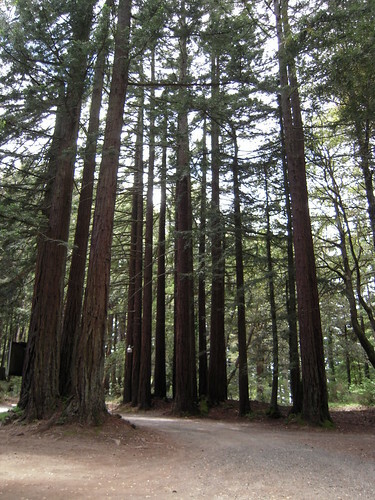 These magnificent trees may be relatively young, but they still take my breath away – and make me proud that they are a part of my country. The tops of the trees just seem to reach toward the sky for an eternity! 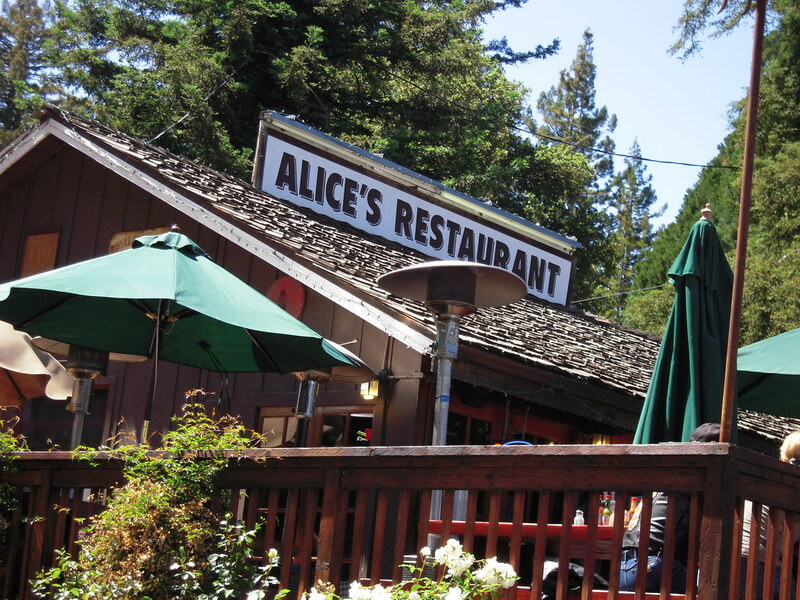 When I stopped for gas at a crossroads, I couldn’t pass up the chance to take a shot of Alice’s Restaurant! This is not the restaurant that inspired Arlo Guthrie’s song of protest against war. In fact, it is the other way around – this restaurant took its name from the song. The original “Alice’s Restaurant” was in Massachusetts. It seemed appropriate somehow, to include this bit of nostalgia here. We had lunch at Duarte’s Tavern in Pescadero – a busy spot where some of the very finest food can be found. I started with a bowl of Cream of Green Chili Soup, a dish I’m going to experiment with making at home. It was heavenly, but there was no way they were going to give me the recipe! I followed the soup with a fried oyster roll. It’s hard to say which was better! A dessert of warm Ollieberry pie with ice cream was shared with my friend. Even though I live in “Paradise,” there is a lot about California I miss. What I do not miss is the traffic, which has gotten worse since I left. I’ve become too accustomed to a more casual lifestyle. Still, I intend to keep visiting whenever I get the chance. You might enjoy watching a video of a this modern-day song that reminds us of what our country is and what it stands for on this Fourth of July Weekend. Wonderful photo essay, Lucy….I’ve only been to both LA and SF airports but have never been anywhere “outside” in California…Hopefully someday I will. I’ve spent many years living up and down the coast of California. I love it there, but my heart is now in Hawaii. It would take a lifetime to see all the wonders of California. Next Next post: Fireworks on Waikiki!